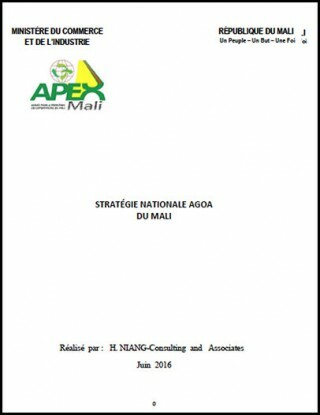 * Mali was suspended from AGOA preferences during 2013, but reinstated as of Jan 1 2014. Among the 25 poorest countries in the world, Mali is a landlocked country highly dependent on gold mining and agricultural exports for revenue. The country's fiscal status fluctuates with gold and agricultural commodity prices and the harvest. Mali remains dependent on foreign aid. Economic activity is largely confined to the riverine area irrigated by the Niger River and about 65% of its land area is desert or semidesert. About 10% of the population is nomadic and about 80% of the labor force is engaged in farming and fishing. Industrial activity is concentrated on processing farm commodities. The government in 2011 completed an IMF extended credit facility program that has helped the economy grow, diversify, and attract foreign investment. Mali is developing its cotton and iron ore extraction industries to diversify foreign exchange revenue away from gold. Mali has invested in tourism but security issues are hurting the industry. Mali experienced economic growth of about 5% per year between 1996-2010, but the global recession and a military coup caused a decline in output in 2012.